If you are waiting for the clear Wink of Stella Markers, they are back in stock! Can it be that this is the last week of May? Wow, it seems that it was only yesterday that we were digging out of 19 inches of snow! Sure glad that’s over! Great News! Stacy Rich is coming to do a Free Demo on June 3rd. The demo will start at 6pm. That’s half an hour earlier than usual so be aware! Join us this Tuesday, May 27th for a free Demo by Peggy Packer. Come see what she does with a couple of pieces of 12×12 paper! It starts at 6:30pm. Did you make something using the Faux tile technique that Bev showed us last week? Everyone, who brings their sample to show, will be entered in a drawing for a small door prize. Come make 4 very different cards from the same basic sketch. Let Marla show you how! Marla’s classes are always a lot of fun! Please pre-register by May 26th, the fee is $15. Saturday, May 31st, 12:30pm by Cheryl Harwick. Fee $15 This is a technique class where you will learn different ways to use embossing paste and stamps and stencils to add texture, dimension and color to your cards and scrapbook pages. the rest of the class will be demonstration, where you may complete a technique on an already stenciled/stamped/dried paste. For the parts that are demonstration only, you will receivea tag sample that you can make notes on so that you can easily duplicate the technique at home. New SEI 12 x 12 paper from the “Diane” collection! Silver Wink of Stella markers are back in stock! Our 2nd Annual Paper Crafter’s Garage Sale is History! We had a great turn out! Thanks to all who sold and a special thanks to all who bought (and bought and bought!) We had a very successful event, Thank you. Special thanks to Marla Nejvara, Candy White and Cheryl Harwick who did all the heavy lifting! We wouldn’t have had it without them. Join us this Tuesday, May 20th for a free Demo by Beverly Mason. She is going to demonstrate a Faux tile technique. It starts at 6:30pm. Did you make something using the color blocking technique that Sherry showed us last week? For all who missed out on the Wink of Stella markers last time they were in, I now have Clear, Gold, Silver, and Black in individual packages. $6.50 each. We got May off to a great start with the Round Robin Yesterday! What fun! Our next on will be Sat.,June 28th. Class size will be limited to 10 students from this point on. Garage Sale! Thursday, May 15th and Saturday, May 17th. How would you like a way to get rid of your unused, gently used or not needed scrapbook tools, paper, stickers, embellishments, rubber stamps, inks, supplies, etc.? Let us sell them for you at our Crafter’s Garage Sale! • Bayer’s Pampered Stampers collects and keeps all money and the seller is paid in the form of Bayer’s Pampered Stamper Gift Certificate equal to the amount of their sold merchandise. The gift certificate must be used on in-stock merchandise by December 31, 2014. 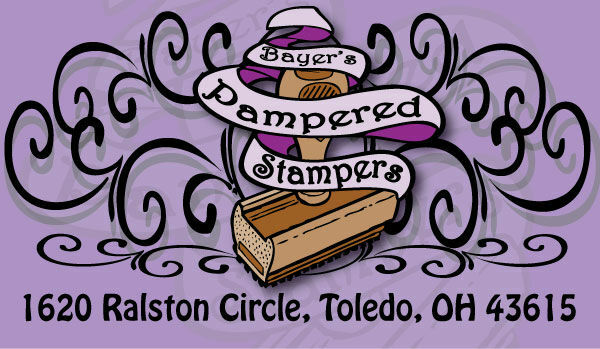 • Seller must pick up their unsold product and payment from Bayer’s Pampered Stampers by May 21st. If you are unable to come at this time, please call in advance and we will try to make other arrangements. Join us this Tuesday, May 6th for a free Demo by Kathy Snyder. She is going to show us how to make a cute “pram” baby card. It starts at 6:30pm. If you tried out the Embossed and Brayered Background techniques that Sandy Booth taught us last week, bring you samples to show us! Everyone, who brings one to show, will be entered in a drawing for a small door prize.